In another incident of animal cruelty and human insensitivity, an eatery owner in India killed a lactating female dog, a mother of new born puppies, by pouring hot oil over her mouth. The female dog had given birth to a litter in the area a few days ago and had stayed too close to the eatery in search of food. 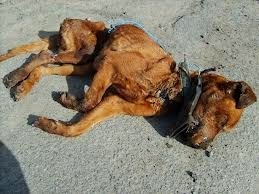 This enrage the eatery owner and he poured hot oil over the female dog's mouth which killed her. She suffered excruciating pain before dying. The pathetic, cruel, barbaric eatery owner should have shown some compassion and given the mother some leftovers everyday, which he would have thrown away in any case, instead he decided to kill her! The growing intolerance, insensitivity and hatred towards animals, apparently for no reasons, has reached alarming levels and ignorant people need to be given a lesson or two in love, compassion and tolerance. It is very difficult to come to therms with this mindless violence resulting in the unfortunate death of a mother of newly born pups. One wonders what has happened to the society and why can't we let animals be on their own! Animals use the resources Mother Earth has given them. They never try to reproduce anything like us humans. They never pollute, lie, conspire or steal...yet we are intolerant towards them. We need to know and understand the fact very clearly that if there are no animals left on the planet, we won't be here either, too!